The Nexus 7 features a gizmo called an accelerometer, which is essential for screen orientation and can be changed to suit your preference. It determines in which direction the tablet is pointed or whether you’ve reoriented the device from an upright to a horizontal position, or even upside down. That way, the information on the tablet always appears upright, no matter how you hold it. The All Apps screen appears. The Chrome app starts. It’s the tablet’s web browser. 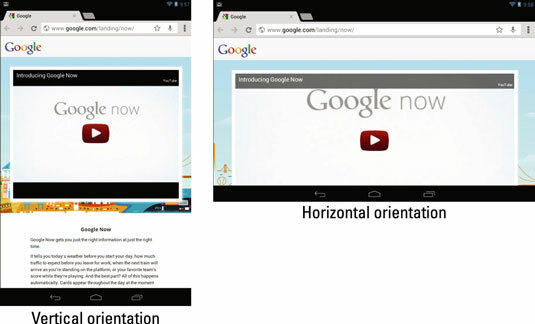 Turn the Nexus 7 to the left or right so that it’s in the horizontal orientation. The display rotates to properly orient the screen content. Most apps change their orientation to match however you’ve turned the tablet, such as the Chrome app. But the rotation feature may not work for all apps, such as certain games and older Android apps. The screen can rotate left, right, or even upside down. The Home screen doesn’t change its orientation. If a Nexus 7 docking station is ever released, the Home screen might change its orientation when the tablet is docked. A great application for demonstrating the Nexus 7 accelerometer is the game Labyrinth. It can be purchased at the Google Play Store, or the free version, Labyrinth Lite, can be downloaded.